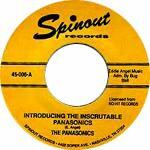 Debut US single for the self described inscrutable Mr. Pan and the Panasonics. Mr. Pan is a darn fine guitar player, and he's caught the attention of Los Straitjackets' Eddie Angel, which is why he's on Eddie's Spinout label. A fun and highly energetic single. You will find your basic thin garage recording, not distorted of bad, just without much depth, and no bottom end.